In this post, I have written about the most simple and easy to practice Vashikaran By Food Mantra for casting an attraction spell on any man or woman. 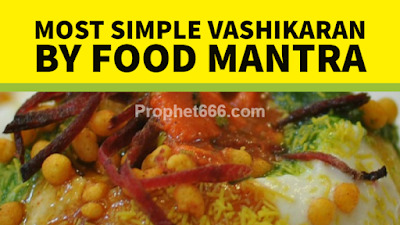 I have called this Vashikaran Mantra most simple because to practice this Mantra you do not have to give food to the desired person but eat the food yourself. As per the Vashikaran Tantra, this Vashikaran Mantra does not have to be Siddh or Mastered before using it for this enchantment by food spell. However, it is better to learn it by heart before actually using it, this is very easy because the Mantra is short and can be pronounced easily by any person. The Mantra Prayog can be practiced just once either before having your lunch or dinner because it is a onetime Mantra Experiment. The practitioner has to keep looking at his food and chant the Vashikaran Mantra just 7 times in order to infuse his food with the power of the Mantra. The word- Amukam in the Mantra should be replace with the name of the desired man or woman. As per the Vashikaran Tantra, the target person will come under the influence of the practitioner within 7 or 12 days. This Vashikaran By Food Mantra Experiment can be practiced for casting an attraction spell for any motive, including love, marriage, business, money or for any other purpose. Note- See the Attraction Mantras, Vashikaran Tone and Totke and Vashikaran Yantras sections for all kinds of attraction spells. Can it be tried daily till the person comes under our control, or is it only once to be tried..
Just try it once, wait for 12 days and you can repeat the Mantra Prayog after that if the desired person is not attracted. Can it be chanted before breakfast? Can the food contain meat? Or only sattwik meal? Normal Food is ok, non-veg food is unadvisable. I have already performed the procedure using non veg food. Should I repeat with veg food?